I love having my children in the kitchen with me….it is the center of our home. Physically, it really is the center….and spiritually, we have a lot of deep discussions around our table. Math: Measuring, adding, subtracting (when increasing/decreasing ingredients)….and since we use freshly ground wheat, we have to change recipes quite often due to a little different ratio with the freshly ground flour vs processed flour. Serving others: I love this….working together around our home and in our kitchen gives us an opportunity to learn about the mission field in our homes with our children watching and learning with us! So, today, ….we are making Granola…..Here are some ways my children get involved…. Monkey Man Rolls the Oats! Kamikaze Kid enjoys the fruits of his sibling’s labor with our home made yogurt! 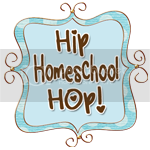 Share with everyone…what you enjoy doing with your children at The Hip Homeschool Hop! How fun! I love the idea of home made granola – I haven't had that in ages! My children, too, have always been welcomed in the kitchen… what a great way to spend time and get all that work done! And, yes, learning. Thanks for sharing!